Have you always wanted to do private training, but didn't know how to go about it? This guide is like having a friend explain it all. You'll start with exercises to assess your current skills, learn about sales and scheduling, and view sample phone scripts. Then it's on to the ins and outs of taking a history: questionnaires are broken down into lifestyle, training and behavior issues, and include explanations of what your clients' answers might mean. You'll get pointers on designing lesson plans and protocols, tips on promoting client follow-through, and an entire chapter devoted to commonly asked questions. There's even a bonus section with ready-to-use forms, contracts and handouts! Where to get further training on behavior issues ...and much more! 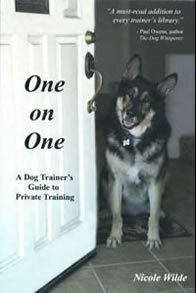 "A must-read addition to any dog trainer's library. Nicole's wit and wisdom convey this important material clearly and accessibly. She is one of the leading professionals out there and her writing celebrates all that is good about safe, responsible and positive training." - Paul Owens, author of The Dog Whisperer: A Compassionate, Nonviolent Approach to Dog Training. Buyers of this book might also be interested in the taped DVD seminar: In-Home Private Training.